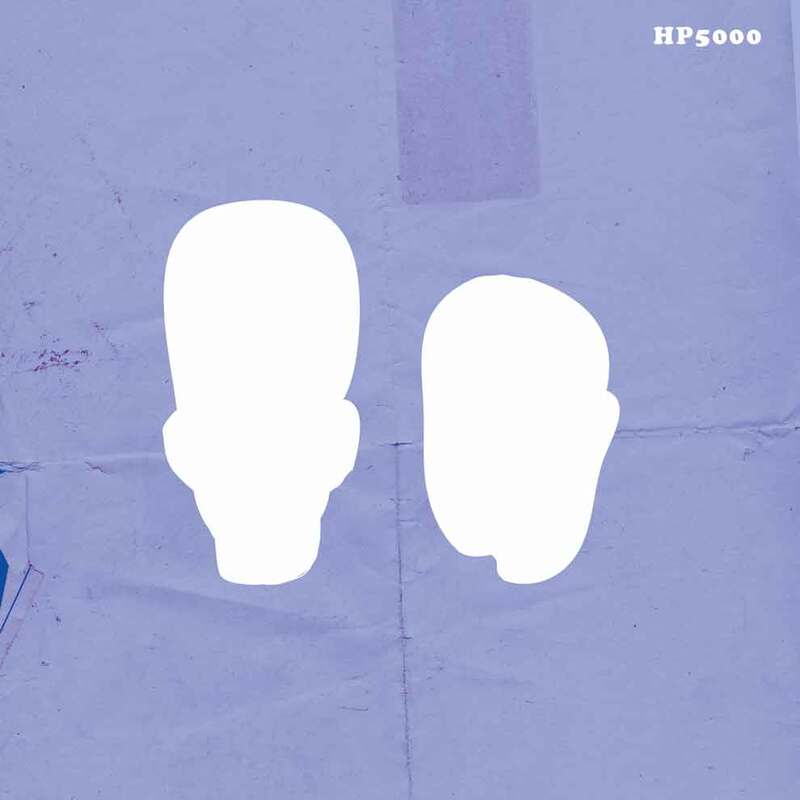 This Friday, me and my fake brother Lukas Kaiser present HP5000 – Free Drinks & Comedy at Brit Pack Theater! DREW MICHAEL (Just for Laughs)! It all goes down at BRIT PACK THEATER – 34 Pell Street, 2nd Floor! If you want to attend, you MUST RSVP. Email BRITPACKRENTALS@GMAIL.COM with the password & number of people in your party BEFORE Friday January 8th at 8pm. This month’s password is: POOL PARTY. The show is always over capacity – it’s a fun time and we want to make sure you GET IN! DOORS AT 8:45. LINE UP EARLY, EVEN IF YOU RSVP’D!! 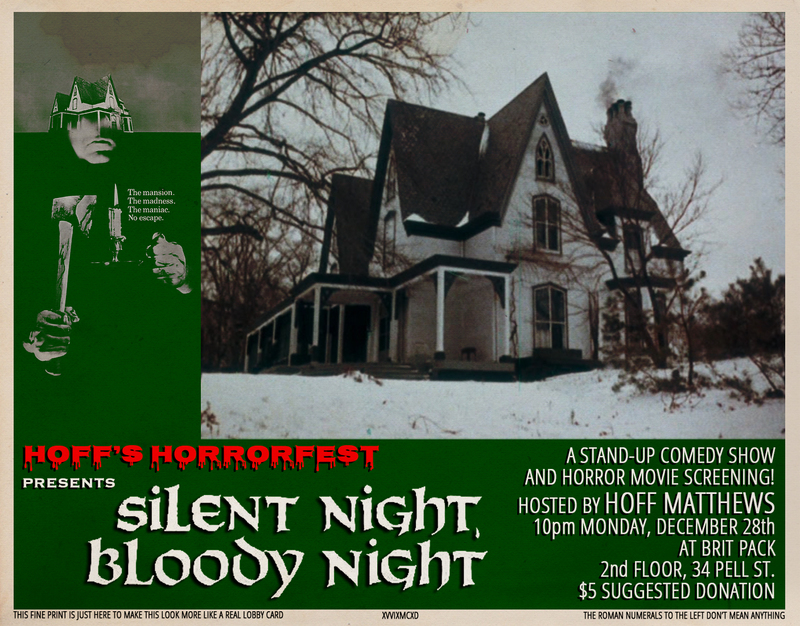 Hoff’s Horrorfest Presents: SILENT NIGHT, BLOODY NIGHT! Hoff’s Horrorfest is a monthly show at Brit Pack (2nd floor, 34 Pell St., Manhattan) featuring stand-up comedy followed by a horror movie screening. This month’s installment will be at 10pm, Monday, December 28th. $5 suggested donation, BYOB. There will be snacks! 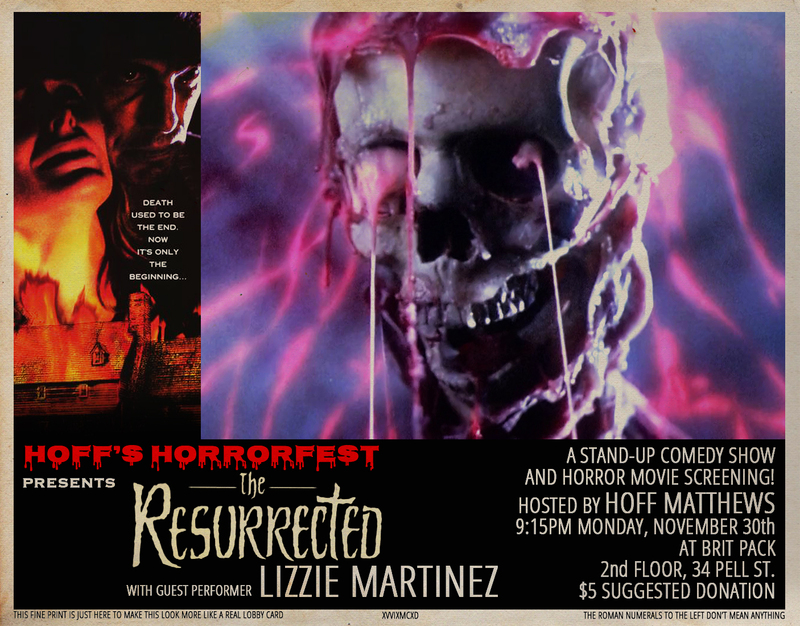 Hoff’s Horrorfest Presents: THE RESURRECTED! Hoff’s Horrorfest is a monthly show at Brit Pack (2nd floor, 34 Pell St., Manhattan) featuring stand-up comedy from Hoff Matthews and a guest performer, followed by a horror movie screening. This month’s installment will be at 9:15pm, Monday, November 30th. $5 suggested donation, BYOB. There will be snacks! It all goes down at BRIT PACK THEATER, in our new location – 34 Pell Street, 2nd Floor! If you want to attend, you MUST RSVP. Email BRITPACKRENTALS@GMAIL.COM with the password & number of people in your party BEFORE FRIDAY, October 9th at 9pm. The show is always over capacity. It’s a fun time and we want to make sure you GET IN! 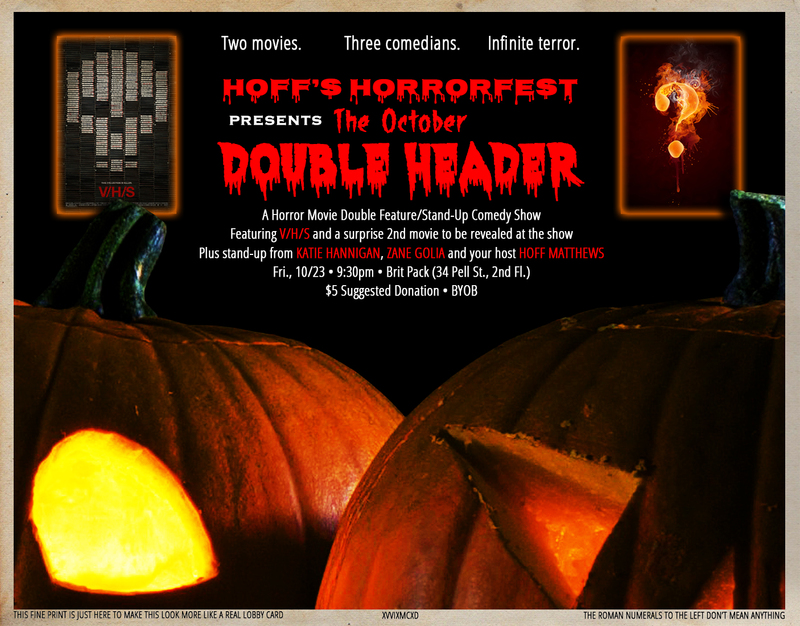 Hoff’s Horrorfest Presents: The October Double Header! Hoff’s Horrorfest is a monthly show at Brit Pack (2nd floor, 34 Pell St., Manhattan) featuring horror movie screenings prefaced with stand-up comedy from Hoff Matthews and guest performers. This month’s installment will be at 9:30pm, Friday, October 23rd. $5 suggested donation, BYOB. This month’s movies: V/H/S (2012) and a surprise 2nd film to be revealed at the show! A lot of people celebrate the Halloween season by watching horror movies. So how does a year-round horror movie screening show celebrate the Halloween season? That’s right: More horror movies. Two, to be precise. It’s the October Double Header! First up we’ll have stand-up from Katie Hannigan, followed by the awesome 2012 found footage anthology V/H/S. Then around midnight we’ll have some more comedy from Zane Golia and reveal the second film of the night, which will remain a surprise spooky mystery secret until then. It’s Halloween! Let’s watch some scary movies! See you on the 23rd! If you want to attend, you MUST RSVP. Email BRITPACKRENTALS@GMAIL.COM with the password & number of people in your party BEFORE FRIDAY September 11th at 9pm. 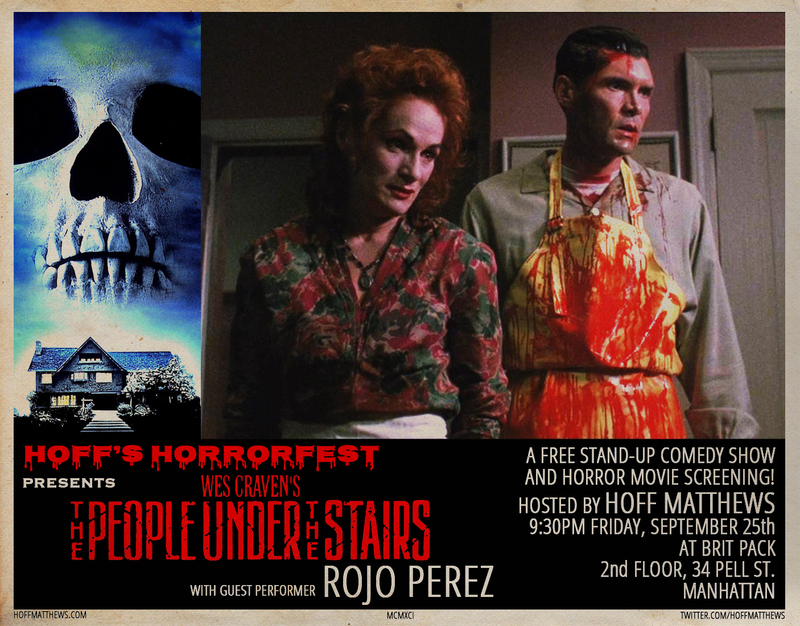 Hoff’s Horrorfest is a monthly show at Brit Pack (2nd floor, 34 Pell St., Manhattan) featuring stand-up comedy from Hoff Matthews and a guest performer, followed by a horror movie screening. It’s free and BYOB. This month’s installment will be at 9:30pm, Friday, September 25th.